A warm thanks to GRROWLS for providing us with 12 years of love and laughs with Rosie, who lacked golden retriever skills like playing fetch or swimming, but made up for it with her irresistible good nature and goofiness. The story we heard when we adopted her was she had been kept in a laundry room and mistreated by some teenage boys. She quickly put that behind her. 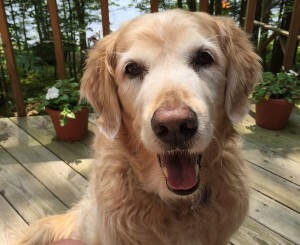 In her time with us, she ruled the house and spent summer weekends at our family cabin in the Adirondacks. We know that 14 is a long life for a golden and we are grateful for every moment. Rest in peace, Rose! !